Last week there were several warm days....50* plus, and the week before, a couple of days in the 60s. Now don't get me wrong: I'm not going to complain about warm weather in late January and early February. Why, good weather is more likely to get people to come to Asheville and stay at this lovely bed and breakfast Inn.And that would be very good news, indeed! But we've also had enough cold and quite a few 'snow events' this Winter to convince me that it is Winter. And, as they say, 'this is getting old'.So when those days came along, and, according to the forecast next Sunday it will be well into the 50s, I was pretty thrilled. Who knew I would be upset about that? But, yes, I'm a little upset and I found myself scolding some of the plants in the garden yesterday. Why? because they've been fooled...again! 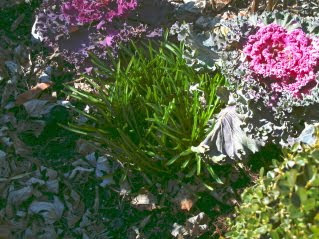 All around the Lower Garden shoots of green have broken out of the mulched surface and are now embarked on growing toward that warm sunshine. Some are 4 inches or more out of the ground! 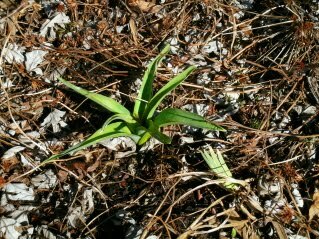 Some are bulbs called 'Star of Bethlehem" and they are cold-hardy, won't be damaged by the next snow and sometimes bloom right through a coating of snow. 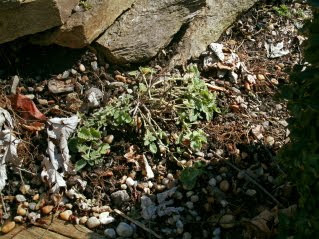 Another is a large variety of catnip called "Six Hills Giant"its new gray-green leaves coming up under that dried leaves of last season....also likely to be OK. But it's one variety of Allium, in particular, (my favorite, called Allium schubertii) that is growing so well. That's the good news. The bad news is: they're gonna freeze again soon! So there was, shouting at them saying, "No. No! Stop!. You're way too soon! 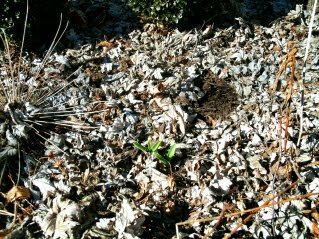 The cold will freeze those buds you're forming and I won't see your bloom later on this Spring!" 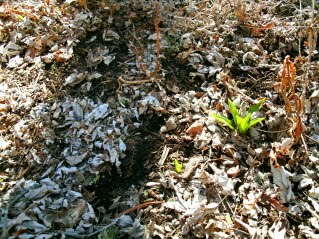 For a moment I did wonder what I looked like, kneeling down and scolding the plants as I piled more mulch on top of the green shoots. 'Some nutty gardener who takes her 'talking to plants' a little too seriously'? No matter, I will even look like a fool to give those lovely plants a better chance to bloom....especially the Allium schubertii. It's a bloom you will not forget: one per plant, and best described as looking like "fireworks", like a ball 8-10 inches across, with 'arms' in all directions with tiny purple flowers on them.And as they dry out, after blooming, the 'skeleton' of that fireworks-like explosion holds its shape. You can leave it in the garden for interest, or even spray-paint them and pile in bowls in the house for a truly unique centerpiece for your table. So, please, please little plants, please sleep a little longer. It's not Spring just yet!